Titanium Sponge for Aerospace & Defense Market size was pegged at USD 1,452.8 million in 2017 and is estimated to exhibit around 4.3% CAGR from 2018 to 2024. Inherent properties of Titanium (Ti) alloys that include high strength to weight ratio, high corrosion resistance, have in turn led to substantial increase in the utilization of these materials for extensive applications. These applications prominently include aviation industry, propellant tanks for satellites and launch vehicles, inter-tank structures, gas bottle/liners, interface rings for satellites, armor plating and landing gear. Integration requirement of alloys in the structure for optimum performance improvement of these systems is expected to fuel the titanium sponge for aerospace & defense market demand. Commercial aircraft manufacturers are among the chief consumers of the Ti foam owing to its requirement for the manufacturing of fuel usage frames, floor beam, wing connections, nacelle engine mounts, fuselage components, thrust reversal units, seat rails, components for auxiliary power units, metal fasteners, and door frames. Requirement of conventional commercial aircraft models ranging from 12 to 50 metric tons is expected to increase to 80 to 110 metric tons in the upcoming models contributing to increased Ti metal to weight ratio of the aircraft. This is expected to provide potential growth landscape for titanium sponge for aerospace & defense market over the forecast period. According to Journal of Aerospace Technology and Management by Institute of Aeronautics and Space (Brazil), Titanium is the fourth most abundant metal in the earth’s crust. However, the utilization of the metal is not comparable the other metals in use due to the difficulty of extraction from the core and processing for commercial applications. Moreover, owing to this the overall capital requirement for the manufacture of ingots is 30 times the requirement for steel, or 6 times the cost of aluminium. This is among the prominent factors influencing the choice of metals for utilization in the aerospace engines and components, is expected to hamper the titanium sponge for aerospace and defense market. Polymer matrix composite (PMC) compatibility is among the prominent factor impacting the development and designing of aircraft owing to increasing utilization of composites for the aircraft structures. Unlike carbon, aluminium, and its low alloy steels that generate high galvanic potential, Ti is galvanically compatible with the carbon fibers in the PMC, which makes it a critical requirement for the structure development. Moreover, the unit pricing of the foam has witnessed significant decline over the past few years, is expected to present strong growth landscape over the coming years. Requirement of aviation grade metals requires series of testing procedures for qualifying the materials for aerospace requirements. For instance, proof pressure testing and burst test subjects these materials to pressures over 500 bar. For qualifying in these tests, the most efficient method is to provide high grade material that feature purity levels of over 99.7%, also referred to as aerospace grade. Requirement to meet the growing demands of aviation and military sectors, majority of the company sales and production include high grade materials, proliferating the high-grade titanium sponge for aerospace and defense market share. Moreover, owing to these factors, this segment is expected to witness highest growth over the forecast timeframe. Leading commercial aircraft manufacturers, Airbus and Boeing that contribute to over 80% of the global commercial aerospace sector are among the prominent consumers of TI foam. As of 2017, these two players accomplished over 1400 aircraft deliveries. However, the company backlogs included over 13,000 as of the end of 2017. B737 and B777 (Boeing model) required approximately 20 to 50 tons of Ti, whereas A320 (Airbus model) required 12 tons of TI for its manufacture. Upgraded models such as B787, A380, and A350 consume over 80 tons of Ti metal for its manufacture, which is more in terms of percentage by weight and volume than the prior conventional models. This trend is expected to drive the titanium sponge for aerospace & defense market size. 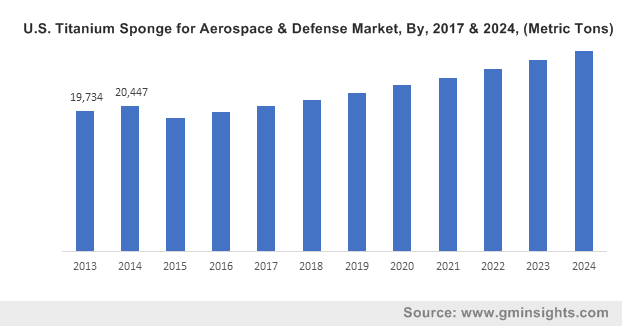 U.S. is anticipated to dominate the global titanium sponge for aerospace & defense market over the next seven years. 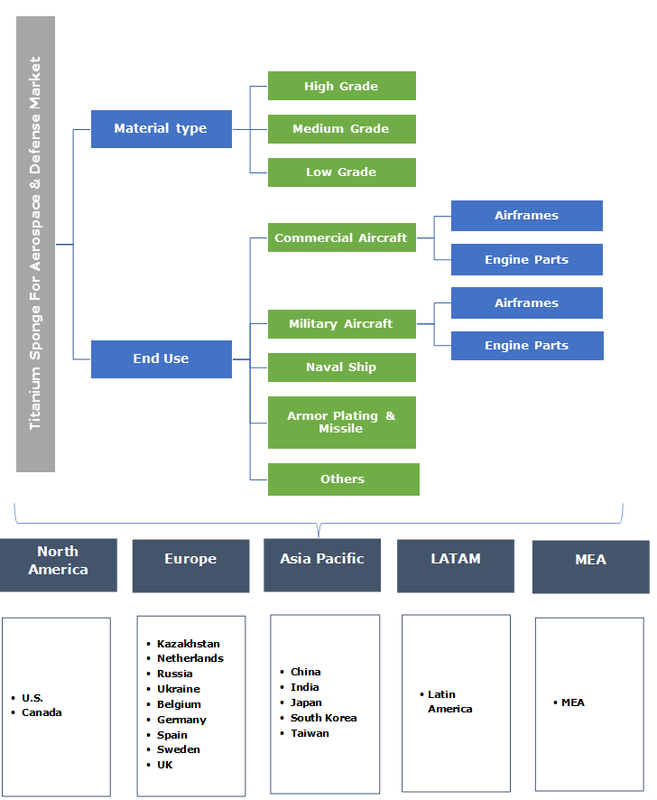 Favored by the highest aerospace and defense expenditure across the globe, and the presence of the major aerospace sector brands that specifically include Boeing and Lockheed Martin, the region is expected to witness stable demand over the coming years. Moreover, utilization of these materials for naval ship hulls, ammunition and missile armor plating will present favorable growth landscape through the forecast period. According to Global Market Insights analysis, China and Japan contributed to over 60% of the global Ti foam production. Moreover, owing to the existing geo-political issues several economies in the Asia Pacific region have escalated their defense expenditure over the past years. Requirement to maintain the strategic leadership over the neighboring economies, the region is expected to witness highest growth potential. Zunyi Titanium, Tangshan Tianhe, Shuangrui Wanji Titanium, Zaporozhye Titanium & Magnesium Combine, Solikamsk, VSMPO AVISMA, Ust-Kamenovgorsk Titanium & Magnesium Plant JSC (UKTMP), OSAKA Titanium, Toho Titanium, The Kerala Minerals & Metals Ltd. and Timet are among the chief contributors of the titanium sponge for aerospace & defense market. High initial capital requirement for the production facility and the difficulty in procuring the clients has in turn led to limited number of new entrants in the industry. Requirement to meet national Ti metal requirements with an internal facility across the major global economies is expected to drive the competition over the forecast period. For instance, in August 2015, Indian government fully commissioned the operation of The Kerala Minerals & Metals Ltd., with an initial production capacity of 500 tons. Owing to this development, India was the seventh country to across the globe, that has its in-house Ti production facility. Commercial and Military aerospace industry contributes the largest share in the overall Ti consumption. Difficulty in establishing contracts and agreements with these aerospace industry participants such as Boeing, Airbus, and Lockheed Martin which account for significant industry shares, has led to significant decrease in the competition intensity. Moreover, titanium sponge for aerospace & defense industry participants are increasingly threatened by the high production costs in conjunction with the low downstream demand. Cost pressure, sluggish material demand, and the requirement to maintain operational profitability is expected to present significant challenges to the industry growth.